Listed below, you will find the Eureka City current water rates and policies. If you do not find the information you need, please contact our office and we will provide it for you. 2) 10,001 + gallons will be charged $3.00 per 1,000 gallons. 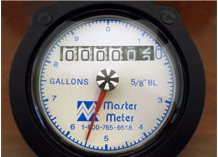 Meters will be read year-round. It is the responsibility of each resident to provide clear access to the water meters, and must remain clear of all debris, vehicles, etc. Residents must choose which option they would like to go with. No monthly payment option is available.